The combination of the Left and Right Brain. 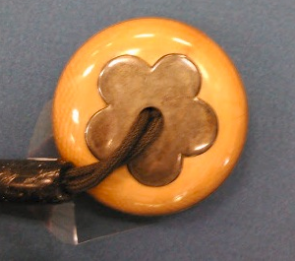 Today, I'm going to take a look at the ancient Japanese pill case/wallet: the Inro, as well as the button that holds the inro on the obi (sash): the Netsuke. This article is a little more technical than my usual posts, so bear with me. And, as with my last post, I cite my references at the end of the article. Unlike some inro, which are purely decorational, these three lacquered inro are well used pill containers, each of which depicts Matsushima. Inro will have a netsuke tied into the color scheme, and sometimes the theme, of the inro. In one instance, there is an inro that depicts a cat chasing a mouse. The netsuke depicts a cat with a mouse in its mouth. Each inro takes a great deal of time and patience to assemble and lacquer. Sometimes, assembling an inro can take even longer than normal if the creator had to discard an earlier version. The depictions of Matsushima on these inro represent the Japanese’s love of the islands. Matsushima supports the title of San-kei, one of the three most beautiful scenes, which happens to coincide with how many inro we will be discussing. The origin of inro or when they started being used regularly is not entirely known. Nor can it be agreed upon when inro went from being purely functional to becoming artistic masterpieces. The process of making an inro is long and, one might say, tedious. The maki-e-shi, the master lacquerer, sprinkles powdered gold, silver, gold-silver alloy, etc. carefully on to the wet lacquer, as was discussed above. Flakes of the same materials may also be used. The metal is then coated with another lacquer layer, and is allowed to dry. The lacquer coating is not beautiful and shiny by nature. It takes countless hours of polishing to bring out the shine. After the lacquer has dried, the maki-e-shi will slowly work away at all of the lacquer, especially over the sprinkled powder with a dog-tooth polisher. The maki-e-shi can’t work at the lacquer too much. If the lacquer over the metal is completely worn away, the maki-e-shi will discard all of his work and start over. In the case of Inro 3, it is more likely that a lacquering technique descended from Tsugaru lacquering. “Lacquer is inlaid on lacquer of various colours. It is done by carving out the pattern on the coloured ground, filling in the cavity with lacquer of the desired colour, and then rubbing it down until the pattern comes out sharp and clear.” Since the colour of the islands does not have the quality of Inro 1 and 2, which appear to be made with gold, it seems likely that Inro 3 was made by the Tsugaru-esque process. The inro we are looking at each have a different lacquer applied to them. Inro 1 appears to have a golden lacquer applied over a red lacquer. Inro 2 has had roiro urushi, a shiny, black lacquer, applied to it. 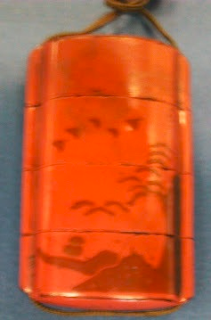 And inro 3 has what appears to be a shu or benigara urushi, a red lacquer. The material used for the design on the inro are different for each inro. Inro 1 was made with kinji koban, a shiny gold. Like inro 1, inro 2’s design was also made with kinji koban. Inro 3, however, has a matte appearance to the design. This could be because a fundame koban, a matte gold, was used. It could also be that the design was created with a darker lacquer under the lighter cover coat. 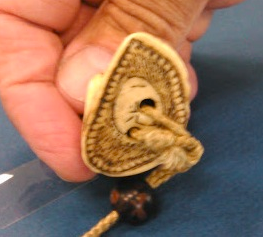 The netsuke attached to each inro are each made of a different material. The netsuke associated with inro 1, netsuke 1a/b, is most likely made out of a whale bone. The netsuke depicts what is most likely chrysanthemums on one side, and something that could be a persimmon on the other side. Netsuke 2a/b/c is made out of bone, potentially a thigh bone. It seems to be a kappa, a creature of Japanese legend. And netsuke 3a/b is wood with a brown lacquer coating. 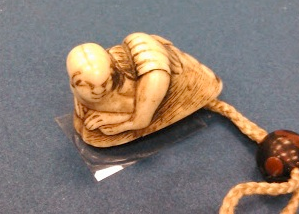 It’s hard to tell what is represented in this netsuke; it is not immediately obvious, or at all obvious. 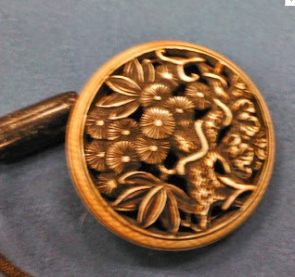 The material it is made of is a common material for older netsuke. Almost as much work went into creating the netsuke as went into the inro. Each netsuke, as we discussed above, is a miniature sculpture, with as much effort in sculpting it as a full-sized sculpture. 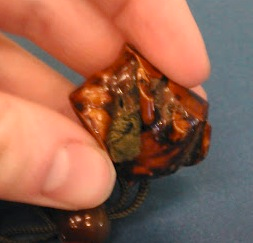 As to the creators of each inro, there is generally a seal marked somewhere on the piece. 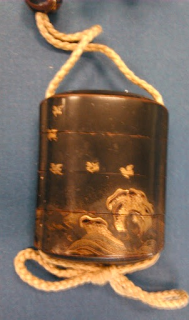 “Many of the signatures are of men of whom nothing is known, although in other cases only the family name is given, leaving the date quite uncertain, although others again are of somewhat doubtful authenticity.” Some inro will have the seal on the netsuke, as in the case of Inro 2, where the seal is on the base of the kappa on a rock. Others will have the seal on the inro, itself. Although each inro has a different type of material that went into creating it, each inro depicts the same scene of Matsushima. Matsushima is “located in the bay of Matsushima, along the northeast coast of the mainland. It consists of 260 small islands adorned with [ines, intricate shorelines, and strange and amusingly shaped rocks. The geological form of this whole area is called rias, which resulted from the submergence of the Matsushima hills cause by a geological fault. It’s interesting to look at the different representations of Matsushima. In inro 1 and 3, the same island prominence is represented, as are the little houses and islands in the distance. It is interesting to note, however, that one is at a slightly different angle from the other. It's easy to see that the inro depicts almost the same, exact view from the tall, protruding rock featured in the foreground. Inro 2 also depicts the Matsushima islands, but it doesn't have the same tall, protruding island. It does have the waves and multiple islands, similar to the other inro. It's also possible that the tall island to the right is the same protruding rock of the other two inro, but from a very different angle. Considering Sotatatsu's depiction of the Matsushima islands, yet another angle is portrayed. All the inro are similar to Sotatsu's painting in that each has two islands, one on the right and one on the left. Sotatsu's painting has an island on the left that looks like an upside-down 'u.' In inro 1 and in Matsusima's painting, the larger islands are depicted with smaller outcroppings of rocks around the base of the island. It's interesting to note that both of the taller islands depicted in the painting and on inro 1 seem to be representing islands that are roughly the same size. This could be because the painting is depicting the backside of the island on inro 1. Inro 1 and the painting are also the only two pieces we are considering that show pines growing on the islands. Brinkley, Frank. Japan, It’s History, Arts and Literature: The Goddess of Fortune, Volume VII. J. B. Millet and Company, 1902. Bushnell, Raymond. The Inrō Handbook: Studies of Netsuke, Inrō, and Lacquer. Weatherhill, 1979. Catalogue of Specimens of Japanese Lacquer and Metal Work. Burlington Fine Arts Club, 1894. Hart, Ernest. Lectures on Japanese Art Work. Society for the Encouragement of Art, Manufactures, and Commerce, 1886. Ponting, Herbert George. In Lotus-land Japan. J. M. Dent and Sons, Ltd., 1922. The Pursuit of Comparative Aesthetics: An Interface Between East and West. Edited by Dr. Mazhar Hussain, Robert Wilkinson. Ashgate Publishing, Ltd., 2006. Transactions and Proceedings of the Japan Society, London, Volume 3 (1893­-95): 7­19. Tomkinson, Michael. “Inro.” Transactions and Proceedings of the Japan Society, London, Volume 3 (1893­-95): 22­33. Urushi: Proceedings of the Urushi Study Group, June 10–27, 1985, Tokyo. Edited by N. S. Brommelle, Perry Smith. Getty Publications, 1988. In this article, I'm going to do a more formal analysis of a Japanese kami and a sculpture of than I usually do. I love Asian art and Asian art history, so I put a lot of research and time into this. If you want to know about my sources, I've included them at the end of the article. The bronze Ebisu sculpture pictured on the left is a skillfully made piece a style that reflects the talent of the artisans. It represents the kami Ebisu in the context of the religious beliefs and philosophies of the people, as can be seen from the traditional Japanese clothing, the design of the figure, and his various accessories. The sculpture is the epitome of ancient practices morphing into modern traditions. One instance is the transformation of the traditional Japanese clothing into symbolic garb that the kami is wearing. To see this, it is important to understand who and what Ebisu is and to understand the development of his iconography. We can then look at how those tie into this particular sculpture and the way in which it was made. There are many different origin stories for Ebisu, one of which has Daikoku as Ebisu’s father. In another, Ebisu and Daikoku are the first Japanese to make a mutually beneficial trade, thus inventing commerce. The story goes that Ebisu was the first angler, a skilled fisherman, who never wanted for fish, but strongly desired to have rice. He decided to go far inland, where no one had access to the ocean. He met with Daikoku and, in exchange for a bag of rice, Ebisu gave Daikoku a large red tai, a fish with good flesh. And so Daikoku and Ebisu became the gods of good fortune, for it was fortunate that they found each other and made such a favorable trade. For this, Ebisu is known not only as the patron god of fishermen, but also as the kami of trade and commerce. By the 12th century, the worship of this kami of good fortune and wealth was strongly associated with markets and small businesses. Ebisu is and was particularly worshipped by small business owners and merchants. A variety of objects, such as rocks, were used as symbolic of Ebisu in the homes of fishermen. In the case of this sculpture, it could have resided in a shrine, in the home of a fisherman, or in a prominent place in a small business as a more literal image to be worshipped. Ebisu was clearly an important deity for fishermen. Even in modern practice, Ebisu is frequently called upon, although the specific reason isn’t entirely known. Because Ebisu represents the ideals of honest commerce, he is an important deit to merchants and business owners. In modern day Japan, kami are still considered important in business. Traditionally, kami represent production and support of the community. “This in turn perhaps reflects a tacit recognition in the Japanese commercial world of traditional views of causation.” For the Japanese, kami worship is already well practiced, so that reliance on kami seems only natural. It also provides a sense of security and support that is probably very attractive in the world of business. Traditional kami have morphed into the modern deities recognized in Japan to be more closely linked with business. By looking at the iconography, this particular object of worship is easily recognizable as Ebisu: he has the fishing rod and the red tai, most notably. Each of the kami’s accessories carries a symbolic significance, whether from direct association with Ebisu or from it’s own merits. We will be looking at the fish, the fishing rod, his clothing, and the rock. The red tai that Ebisu carries under his arm is not only symbolic of the kami, but is also a national symbol for Japan. A fish known for it’s good white flesh in good quantities and consistent quality, it’s no wonder that it’s associated with their deity of good fortune and good luck. So important is the red tai (and all fish) to the Japanese that they will ritualistically bury the bones of the fish near or under a shrine. It was thought that the fish had allowed itself to be caught and that the spirit would return to “their ancestors, and their flesh having been disposed of, they would return later to be caught and killed again.” A ritual performed would involve a ‘head-striking-stick’, with which the fisherman would kill “his catch by knocking it on his head. Chief Penri told Batchelor ‘that these fish liked being struck on the head and thus killed.’ It was the orthodox way of ‘sending the divine creature away.’” Even though Ebisu is the god of fisherman, this statue doesn’t have a ‘head striking stick.’ One might stipulate that it’s because Ebisu, like the fish, is a divine being and doesn’t have to follow the practices of mortals. More likely, it is because this is a more obscure reference to Ebisu. Since Ebisu is recognized as the first angler of Japan, the fishing rod is a key feature that strongly identifies the sculpture as one of Ebisu. Rice and fish are probably the two most important foods in Japan, especially since Japan is nothing more than islands, making it easy to obtain fish. Fish are also a common theme in many Japanese myths, implying that Ebisu is not unique in having a fish in his symbology. He does appear to be unique in that he’s the only kami to have a red tai. As stated above, Ebisu can be seen in many different outfits. This particular sculpture has Ebisu in a sashinuki, a set of trousers similar to the hakama but gathered at the ankles. The sashinuki were commonly worn for hunting, being more convenient than hakama and easier to move around in. They varied in colour and fabric, depending on the age or rank of the wearer. In the case of this Ebisu sculpture, the material and colour are not discernable. While it’s hard to tell which period this sculpture is from, it is most likely from the Meiji period in Japan, although Edo period is also a likelihood. However, it is more likely to be Meiji, since the figure is so detailed. Ebisu’s face is round and almost cartoony, but the features are very realistic, like the Kei-school of sculpture. The wrinkles in his forehead don’t appear to be stylistic representations, like the folds of flesh on the neck of a Buddha from earlier periods. The detail in Ebisu’s hair, how it appears to consist of strands, is also characteristic of the Meiji style of sculpture. The red tai that Ebisu has caught is also very similar to other Meiji style fish. The scales are defined individually. The details on the fish around the gills and the face also look to be almost hyper-realistic, which is characteristic of the Meiji and Kei-school styles. Ebisu’s garb is also very detailed and not stylized like earlier varieties of sculpture. The folds don’t follow any particular pattern or have a consistent repetition. Also suggestive of Meiji style sculpture is the lack of texture on the kimono and sashinuki. The realistic details are similar to the realism found in European sculpture, suggesting that this sculpture was influenced by Western art. Even in this one Ebisu sculpture, we can see the history and origins of Ebisu are far from simple. The Shinto practices associated with Ebisu can be directly related to the bronze Ebisu sculpture through analysis of the kami’s iconography and how it was crafted. In the many beliefs associated with the deity, the patron of fishermen and of commerce seem to be the most common. The strong beliefs in the nature of fish and fishing is evident from the worship of an angler and his fish, as is the worship of his representation in small businesses and marketplaces. This bronze Ebisu sculpture is a skillfully made piece, not only in construction, but in how it represents the different aspects of Ebisu. Ashkenazi, Michael. Handbook of Japanese Mythology. ABC-CLIO, Inc., 2003. Condor, Josiah. “The History of Japanese Costume,” Transactions of the Asiatic Society of Japan 8 (1880): 333-368. Encyclopedia of Ancient Deities. Edited by Charles R. Coulter and Patricia Turner. McFarland & Company, 2000. Holder, Charles F., and David S. Jordan. Fish Stories: Alleged and Experienced. Henry Holt and Company, 1909. Naumann, Nelly. “Whale and Fish Cult in Japan: A Basic Feature of Ebisu Worship.” Asian Ethnology 33(1974): 1-15. Picken, Stuart D. B. Essentials of Shinto: An Analytical Guide to Principal Teachings. Greenwood Publishing Group, 1994. Reader, Ian, and G. J. Tanabe. Practically Religious: Worldly Benefits and the Common Religion of Japan. University of Hawaii Press, 1998. Reader, Ian. Religion in Contemporary Japan. University of Hawaii Press, 1991. Scott, David A. Copper and Bronze in Art: Corrosion, Colorants, Conservation. Getty Publications, 2002. Ever since I found out about it, SpaceX has been my favorite company and Elon Musk, my role model. Musk has done many cool things that I admire, for instance, starting up PayPal. He's also the CEO of Tesla Motors, a car company that's leading the way in 100% electric cars. But it's really SpaceX that I'm going to focus on in this article, specifically, SpaceX's new space suit design. I'm pretty sure that Elon is really working to make space travel hip and cool again. During the '60s, space travel was pretty popular because of JFK announcing that, "I believe that this nation should commit itself to achieving the goal, before this decade is out, of landing a man on the moon and returning him safely to the earth." It was also a competition to beat out Russians to show that our nation was greater. Since then, though, the interest in space travel has slowly declined. Although it isn't the most accurate, Google Trends shows a 65 point decline in searches for "space travel" from 2004 to now. A lot of high schoolers don't even know that we have a space station orbiting the Earth. I believe that Elon Musk is working to change this and bring back enthusiasm for space travel. One way he seems to be working towards this goal is by getting a super hero costume designer. The costume designer he's hired is Jose Fernandez, a designer that's worked on the '90s Batman movies, Daredevil, Alice in Wonderland, and Thor, to name a few. You can find Fernandez's resume on IMBD here: http://goo.gl/qP3I9H . I really think that having super hero themed suits is a great plan, since astronauts are pretty much super heroes. The rigorous training and preparation they have to go through is something that the average person would be incapable of. Super space suits will also appeal to the younger, nerdy audience. And since the younger generation will slowly have more an more influence over the happenings in this country, appealing to them and their fantasies is sure to make space travel cool again. It also probably helps that Elon Musk has made appearances in popular movies, such as Iron Man and Machete Kills. I'm excited and hopeful for the future and Elon Musk makes the future look bright. An artist from the Placer County area. His work focuses on sleep paralysis and his personal experience with it. Formerly an Aerospace engineer (rocket scientist), Mark is another example of an artist/mad scientist hybrid. He currently draws a comic about Clay, an engineer fresh out of college, and his new job at a low-tech rocket plant. An amateur astronomer, sharing his love of astronomy through astrophotography.